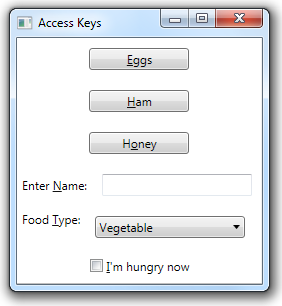 For controls that don’t have their own textual caption, it’s common to define an access key for a nearby label. When that access key is activated, the control without the caption gets the focus. In the example below, there is a TextBox where you can enter your name and the nearby Label “Enter Name”. This screenshot was taken after the ALT key was pressed, so the ‘N’ in “Enter Name” is underlined, indicating that ‘N’ is the access key. If the user presses ALT-N, the TextBox will get focus and they can then begin typing the name. You can specify the control that should be the target of an access key by using the Target property on the control where you define the access key. It would be nice if there was a way to use ctrl instead of alt….